Calling all Greater Mankato artists and creatives! 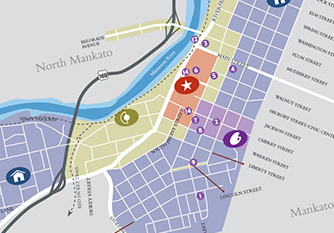 The City Center Partnership is gearing up for Phase II of INFUSE: Artists on Main Street Mankato. This year we will be funding large (up to $10,000) and small (up to $1,000) projects. Our goal is to activate Washington Park, one of the largest green spaces in our City Center filled with history and diversity. Projects can be temporary or permanent, performances, events, visual art; whatever you can come up with! The workshop, led by Springboard for the Arts and the Preservation Alliance of Minnesota will give you the information you need to submit a proposal. All are welcome! You must attend to apply.